The photo’s I made of my latest cooking experiments didn’t turn out very well unfortunately, but I still want to share them. Last friday I made veggi puffs. I pre-baked ready-made puff pastry for 15 minutes. I let this cool and pan fried slices of aubergine/eggplant and slightly colored strips of peppers in a pan. To complete the veggi puff, I turned around the puff pastry and spread on a thin layer of onion/tomato relish as a base. 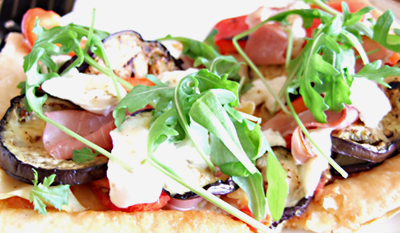 This I topped with semi dried tomatoes, marinated artichoke, strips of red pepper, the slices of eggplant and torn cured ham. Back into the oven for about 10 minutes and finish with mozzarella and arugula. Sunday morning I used left over raw puff pastry to make spinach and feta rolls. Stir fry a bit of wild spinach with some garlic powder and a little dash of water. In a bowl, mash feta cheese together with some oregano, salt and pepper. 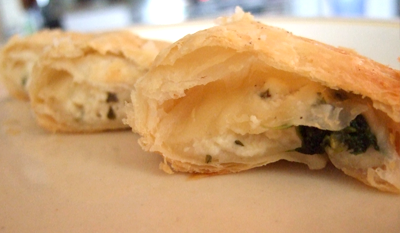 Take long strip of puff pastry, top with feta and spinach (make sure the spinach isn’t too wet) and roll. Bake in the oven for about 20-25 minutes. This was so surprisingly good! The oregano really brought out the feta. It’s a shame I didn’t have more puff pastry. Sunday was super lazy dinner. 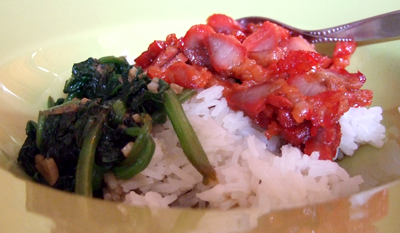 Stir fried wild spinach with garlic, soy sauce and oyster sauce with rice and ready made char siu. We got the char siu from a shop in Rotterdam where they roast the pork themselves and you can buy it fresh out of the oven. They also have crisply roasted pork belly *drool*, roasted duck, roasted chicken, ready made sweet and sour pork, so much goodness! Hi, I have a question: from which shop in Rotterdam did you buy the char siu? I bought it at May Fung. Walk past Wah Nam Hong from Kruisplein, past Nighttown/Watt, KFC and a little further up there is a small toko named May Fung, green sign with white letters.